Much of the material in this post was contained in a paper delivered to Largs Historical Society by David B Smith on September 24, 1998. Dr John Cairnie was a Stirlingshire man, who after study at the University of Glasgow and an apprenticeship in Edinburgh which qualified him in 1791 as a surgeon, and after a voyage to China, joined the Honourable East India Company. That he should have chosen to work in tropical climes is curious in a person whose later life is almost exclusively associated with the ice of his native land, and the ancient, Scottish manly game which was played upon it. Indeed, if he had not lost part of his left arm in an incident with gunpowder, and retired the Service, I wonder if he would have played the important part he did in fostering the national game of Scotland. Little is so far known about his early life, beyond that he was born at Dunipace near Denny in 1769. He was the second son of Neil Cairnie, principal partner of the firm of Thomas Shiels and Company, which ran the Herbertshire Printfield in Denny. I am sure that there is much to be learnt about his earlier years and of those he spent in the service of the East India Company. We know that he first served for some years in Ceylon and that in 1802 he was promoted surgeon and thereafter served with the 2nd Madras Native Cavalry. We do not yet know the nature of the incident which separated the good doctor from his left hand, and, therefore, from the practice of surgery, but we do know that he retired to Scotland, where he married Agnes Galbraith in 1805. It is usually stated that Cairnie settled in Largs in about 1810 and proceeded to build his well-known villa (Curling Hall). He may well have moved to Largs before that. John Cairnie joined the Duddingston Curling Society in January 1804, before it had begun to become the very important club that it later was. In the minute recording his admission he is designed already as of Largs. "We had a famous match on a sheet of water called the Drumlie Meadow, near the village of Denny. The most of us mustered on the ice before eight o’clock in the morning, and finer ice, perhaps, never was seen that was water-borne. We had an early breakfast and a collection was made for a supply of vivres to be used on the ice during the play. These consisted of bread and cheese with porter ad libitum; and such of the company as chose had hot pints prepared, consisting of porter, eggs, biscuit, sugar, and whiskey, of a consistency as thick as ordinary porridge - and well might it be called meat and drink - and altho’ we partook freely of all the refreshments, we believe the whole party kept perfectly sober, at least none of them were so tipsy that they could not handle their massy granites with best effect; and that they were massy cannot be doubted, as one pair of them weighed 72 lbs. each stone. They were played by a very powerful man named William Gourlay, who at that time we reckoned the king of the Curlers; and the execution done by them was most surprising, for, when forcibly played full, they moved after taking off the guard, and in their progress often raised half a dozen stones in succession and gained the shot that was declared to be impregnable. Opposed to this chieftain of a player was an ambidexter named Aleck Cook. He was also a powerful man, and had arms of extraordinary length, which he could swing so high with the curling stone behind him, that when about to raise the double guards, a person standing on the tee opposite could see its entire bottom. Several games were played, and it had been so arranged that every curler was to have a lanthorn and candle on the ice, which, with the aid of a fine moon, enabled us to continue the game till four o’clock in the morning, when, after emptying every bottle and pint stoup, we parted, much against the wishes of some of us, who would have preferred making out the 24 hours on the ice." "On a certain occasion one of his own name, in spite of friendly warnings, played a rink of stones at Denny over ice that was much too weak, with the result that the whole lot went to the bottom of the pond. The accident would not have mattered had not the stones been required for an important match on the following day. Having reviewed the whole situation carefully, Mr Cairnie, all heedless of the biting blast that was blowing and the deep and dangerous character of the pond, calmly divested himself of his clothing and dived for the stones, one after another, until all were safely landed. It is pleasant to be able to add that Mr Cairnie was so little the worse of his adventure that he assisted in brilliant style to play the rescued 'channel stanes' to victory on the morrow." These two stories show us something of the man. He was an enthusiast, and he carried his passion to extreme lengths. The population of the parish of Largs at the time when Cairnie moved there was about 1800 souls. We do know that the village was then more isolated than later for it was not until later that the turnpike road from Largs to Kilbirnie and beyond was built. It was not until 1838 that the gasworks was erected, and until 1839 that the streets were lit by gaslight. Similarly, when Cairnie came there was no harbour of any efficient sort. 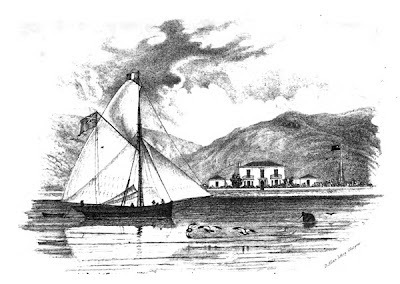 Steamships began to ply in his lifetime, and a company was started, with thirty-one shareholders, of whom Cairnie was one, and it sought the power by private Act of Parliament to build a harbour at Largs, which was first used on December 1, 1834. Cairnie and his friends indulged in all the usual gentlemanly pursuits of the day. He certainly enjoyed hare-coursing and no doubt kept a few grews [greyhounds] of his own. Meikle suggests, God forfend, that he participated in cockfighting. He kept a pair of small but high-mettled black horses for drawing his comfortable, yellow coach. He certainly liked bowls and made a superb green in the grounds of Curling Hall, to which his many friends were invited. Sailing was obviously also a passion. His yacht, the Nancy, lay at her mooring off the shore below his villa during the summer, and on her cradle beside it during the winter. He was a founder of the Royal Northern Yacht Club. One can confidently assert, however, that all these interests gave way to his obsession, the roaring game. In fact, although the frontispiece to his Essay depicts two of his great joys, the yacht and Curling Hall, he gives the game away by what he writes of it: "The frontispiece shows a view of our Cutter coming to her moorings with a few selected pieces of granite for Curling sport, taken from the shore of Ailsa Craig; and on the hills behind, in the distance, the Largs and Gogoside Clubs have their natural ponds, which supply an extensive field of ice in a frosty winter." Not only was the vessel pressed into service for the carriage of curling stone metal, it served other curling purposes. Cairnie says, "We cannot help making one more digression, and letting the inland curlers know how we at the seaside occasionally amuse ourselves after our day’s sport. We have what we call pic-nic dinners, where every Curler provides his own dish, and brings the drink he likes best. We, last season, had four of these pic-nics, and the scene of festivity was on board of our cutter, lying high and dry upon her carriage, by the seaside." From the end of the eighteenth and, particularly from the beginning of the nineteenth century, curling as a sport began to be organised in properly constituted clubs, or societies, to use a term commonly used at that period. Cairnie not only introduced the game of curling to Largs but he was involved in the institution of the first club, The Noddle Curling Club. On the reverse of the title page of the surviving minute book of the Noddle Club appears in Cairnie’s hand. "The first curling was at the pond beside South Kirkland House on the 13th December 1813; the commencement of a long continued and severe frost - The Members formed themselves into a Society in the Spring of 1814 but no book was kept before that now commencing December 10, 1814." In his own book Cairnie writes, "In the month of January 1814 the Curlers had fine sport on the Noddle Burn, and were so delighted with it, that they adopted the name of the Noddle Club." The members of the Noddle club a few years later decided to form themselves into the Largs, or Largs Thistle, Curling Club - the name under which it still exists, and a rival club to the Noddle, the Gogoside, was formed shortly thereafter. As already mentioned, the earliest Noddle Minute Book survives. For a period Cairnie was the secretary and kept the minutes, and used the book as a sort of personal curling diary. The flavour of the man comes through. He refers to himself, as befits a secretary, in the third person but that does not prevent him from making his personal views about people and events very clear. Here are some entries from the winter of 1819-20. 13 December 1819. "... Four most excellent games ... Two bottles were emptied upon this occasion. Mr Cairnies’ party gained all the four games and were in high spirits at their having shewn such good play to players supposed inferior to few..."
15 December. "... Two bottles of whisky part of a bet gained by Mr Carnie were produced and another bottle of common whisky for the use of the club ~ looking like a change of weather." 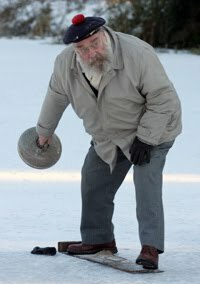 On 20 December during a thaw he wrote a curling will in the book by which he gave some stones for the use of the club. 29 December. "... a bottle of rum from Mr Craig (a bett) was consumed; a bottle of whisky from Mr Cracknell ... Played till 5 pm"
31 December. "... Victory again crowned the side of the Secretary... A slam was the produce in this game Arthur’s side being 8 Shotts to 0 - alias nothing. It was agreed (the Ice being mostly covered with snow) that it be cleared immediately and orders to that effect were given - A bottle of Radical Whisky was consumed, and the party with the Secretary left the ice at half past 3 leaving a side to practice ... this year has afforded more sport, than the five previous years all put together." 1 January 1820. "The Secretary being unable to form a proper party this night (with the assistance of a fine moon etc.) he sent a challenge to John Bull who did not appear in time, but 3 of the Members Messrs T. Underwood R. Brown and J Cairnie after the clock struck 12 had several curls with the stones on the frost - who should play farthest - J.C. Victor." 1 January, later. "...Bad play all day, partly from the bias on the ice, but more so from seeing in the new year - 2 bottles one of Rum the other of Whisky old betts were consumed on the ice; parliament cakes in abundance.... It is pleasant to think tomorrow is a day of rest for my bones and back and all feel sore and out of order..."
18 January. "...A challenge from the Comrate people was sent and should the day answer it will be further reported upon tomorrow - ..."
An equal number opposed them with stones quite unfit to appear on any rink of Curlers, some were Oval, some triangural and only one of them fit for Muster. On ending of the game the members were 21 to 12 - in favour of the Noddle or Largs - here as Mr Wishart forgot the number fixed on The Secretary left the ice resolved not to play that person again upon any terms ~ The Secretary’s pocket bottle, and an odd bottle gained by him from Mr Ewing together with the bett for a pint; Cheese and Bread were consumed ~ N.B. Should I ever play those Curlers again, I shall take care their stones shall be agreeable to those in our; in all other Clubs, had that been the case it is in my opinion doubtful if the Comrate party would have reckoned one in the game." On 21 January they played and beat Kilbirnie, and Cairnie treated them all to "2 bottles and 14 pyes @ 4d." On 24 January he summed up the season by stating that at least 49 games had been played. "We can also boast of beating the Kilburnie picked side and of a trifling victory over a sett of beginners upon the Comrate." That triumphant summation of the season is important from two points of view. First, it shows that Cairnie, though every inch a sporting man, was not quite what we would call a good sportsman: he did not like to lose. Second, it illustrates how precarious was the game of curling, for it depended entirely on the chance not merely of frost but of continued frost. That is why The Secretary exulted in the large number of games they had played. You may be wondering about the nature of the lochs and ponds upon which Cairnie and his friends had such good fun. These were shallow water ponds. They were generally constructed for the sport, and were generally large enough to accommodate several games simultaneously. The mode of construction was usually this. Earthen banks were put around the levelled area and a sluice constructed to allow water to be put on in November and let out in March. The depth of water was six inches to a foot. Curling clubs throughout the country spent a prodigious deal of time, energy and money on planning, making, and maintaining such ponds. The advantage of a shallow pond over a natural loch was that it took less frost to freeze it, but it still required a frost of three or more days’ duration to create ice of sufficient strength to bear a game of curlers and their stones, and autumn’s floods could wash away the summer’s building work, and water voles could by their burrowing make the bankings like a sieve. These perennial and different problems were solved by Cairnie. About 1827 he put to the test the idea he had been carrying around in his head for about twenty years, that of creating a perfectly level, impermeable surface, onto which, as soon as the thermometer reached 32 degrees F, water could be hosed or sprinkled to form ice almost instantaneously. It will not surprise you to hear that, "We were led to think of this simple invention from a plan we, with many other boys, have practised in our younger days, that of making ice on pavement, which we have often done to the great annoyance of his Majesty’s lieges." Cairnie’s idea caught on at once, and all sorts of different surfaces were utilised, wood, tarmac, cement, even cast iron plates with flanges which were bolted together and supported on brick piers. The number of potential days of curling was quadrupled. In 1833 Cairnie was forced to write a book about his invention, for it had come to his ears that the Rev John Sommerville from Currie in the Edinburgh area was claiming the invention as his own. The Essay on Curling and Artificial Pond Making was the result. Polemical in intent and somewhat intemperate in language, it does nonetheless include a delightful mixter-maxter of curling lore, and we are all in debt to the minister from Currie for that. 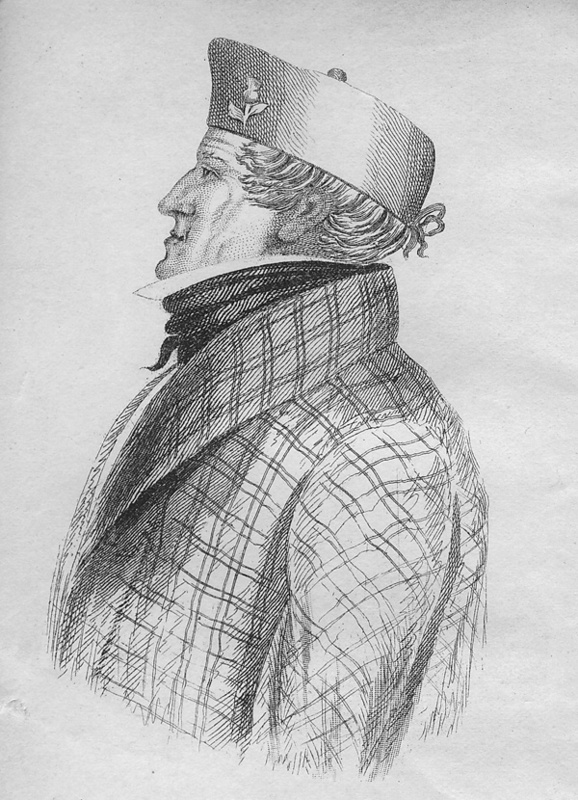 An anonymous reviewer of the book in Johnstone’s Edinburgh Magazine says after recounting some of Cairnie’s amusing anecdotes, "All this pleasant information was given to Mr Cairnie of Largs, an amateur Curler, whose discovery of artificial rinks promises to do for the noble game what rail-roads have done to travelling, and steam to voyagers." Top: John Cairnie. This engraving appears as a frontispiece to the Grand Caledonian Curling Club Annual for 1844. This is described therein as follows, "Prefixed to the Annual is a lithographed likeness of Mr Cairnie of Curling Hall, first President of the Royal Club, taken from a miniature of him which was lindly sent to us by Mr. Lindsay, Secretary to the Belfast Curling Club. That Club, we believe, is the only existing offshoot on the other side of the Irish Sea; at any event we know that it is the only club in Ireland which is associated wiith the Royal Caledonian, and we have been informed by the gentleman referred to, that it owes both its existence and affiliation to the influence of Mr. Cairnie. 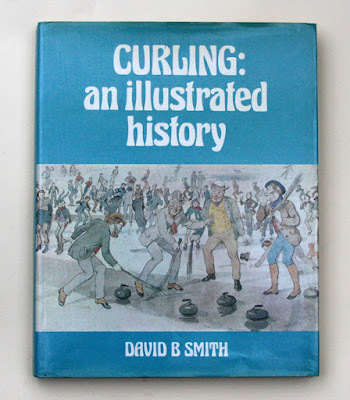 The resemblance of the lithograph is very good, and brings at once to our remembrance of the old gentleman when he came into the Waterloo Rooms..."
The Curling History blog was set up in 2008 by curling historian David B Smith and Bob Cowan, former Editor of the Scottish Curler magazine. Back then, both of us were passionately interested in the history of curling and we hoped that the blog would bring together all interested in the history of this great sport. David died on November 30, 2015. The blog is continued in his memory. Comments and questions are welcome! Email Bob: skipcottage@gmail.com. David at Coodham in 2010. Photo by Bob.